Received pens this afternoon and would like to say... I AM DELIGHTED : ) Thank you very much indeed! Top quality work and customer service. Will certainly be in touch with more commissions soon. Our pens arrived today. We are very impressed with the quality, and the fact that we received these a day earlier than expected. Thank you very much. We shall definitely recommend you and use again. 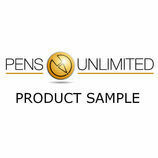 Welcome to Pens Unlimited - we are here to design, print and deliver branded pens, pencils and other promotional merchandise. 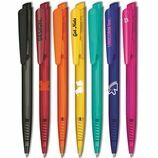 At Pens Unlimited we have the equipment and expertise needed to offer a wide range of custom printing options to best suit your needs. We cater for all artwork requirements from one colour screen printing to digital full colour print or even engraving. Our extensive range of printed pens includes plastic, metal and wood pens, eco-friendly pens, highlighters and pencils in a variety of colour options to ensure that you can match to your brand identity. We offer a range of printing options, including artwork (e.g. 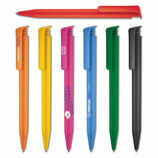 your logo) or text, which can be positioned on either the pen barrel or clip. 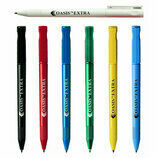 Personalised pens are the most popular promotional product due to their usefulness, fantastic staying power and low cost. 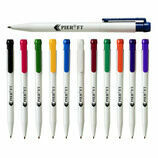 Branded pens are ideal for trade shows, exhibitions and other promotional events, placing your brand in the hands and desks of existing and potential customers. 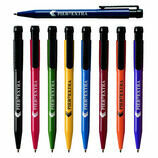 Good-quality promotional pens will be used for months or even years, creating long-lasting exposure to your brand, improving recognition and preference over competitors. With so many companies offering custom pens, it must be tough to choose who to go with, so here’s a few reasons to choose us. Easy artwork upload - Upload your artwork in almost any format and our experienced designers will handle the rest. Competitive prices - We offer excellent rates for all quantities from 50 to 10,000+ units. In-house expertise - From artwork design to printing and packaging, your order is handled by our in-house team, ensuring excellent standards from start to finish. 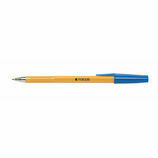 35 year BPMA member - Buy with confidence from a long time member of the British Promotional Merchandise Association. 100% refund - In the rare instance that you are not happy with the artwork proof we produce before printing, we will offer a full refund with no questions asked. Excellent customer service - We are proud that our high standards of printing and customer service has built a loyal customer base. But please, don’t just take our word for it, have a look at some of our most recent reviews. 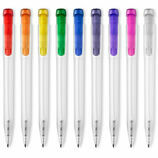 If you have any questions about promotional pens or printing processes, please contact us and one of our experienced and knowledgeable staff will be happy to assist.